Searching for the beginner's Guide to SEO "Search Engine Optimization"? Our SEO experts have compiled a list of the best tips, strategies, advice, and ways how to boost and increase your search engine rankings on Google and search engines. With these tools and tips for SEO, you will help improve your results for your business' keywords: short, mid-tail, and long-tail keywords - to best optimize. Searching for a beginner’s guide to SEO (Search Engine Optimization)? SEO fills most beginners with dread. They think they need to be a computer whiz to do it. Or that optimizing a website is only something SEO consultants can do. Not to mention, it’s a field that’s constantly changing. Tons of SEO tips are out-of-date or just not right for a beginner that wants to start growing traffic right now. That’s why we wrote this article. This article covers seven beginner SEO tips. These are all practical, simple-to-implement tips you can put to use right now to start improving your rankings. And here’s the good news: Anyone can do them; no computer science or marketing degree required. Keyword research is the process of finding the keyword phrases that people use to find your website. And it forms the basis of any SEO strategy. When you’re targeting the right keywords, your pages are aligned with user’s search queries. That means your traffic is more relevant, which means they’re more likely to turn into a lead, make a purchase, or subscribe. But most don’t know where to start. Fortunately, there are some easy tools you can use to find the most important keywords to target on your website. Guide to SEO For Beginners. 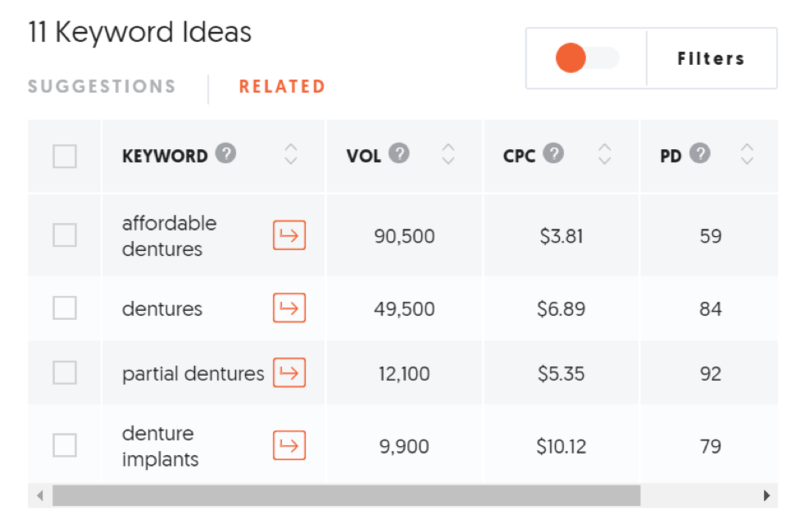 You’ll get tons and tons of keyword ideas. Some will be highly relevant, while others will miss the mark. It can be a little time consuming, but whittle down your list. Marketing and SEO Tip: Look for keywords that have high traffic, but low-to-moderate competition. These will be easier to rank for, but still have tons of traffic potential. How to select keywords for your website. There are bunch of free keyword research tools online that can help you expand your list and add to it. A favorite is Keyword.io, a tool that uses Google autocomplete responses to generate longer keyword lists. You can add these keywords to your previous list from Keyword Planner. Now you have a broad list of keywords that you can target on your website. What you will notice is that there’s commonality between each keyword and that the other terms added are all related to finding the highest quality search engine result. But for beginners trying to understand search engine optimization, the key is understanding that you can use up to 3 (or more) keywords on your page in spots that make the most sense. OK, so what do you do with all these keywords? Well, one of the best strategies is to break things down by product/service or piece of content. For example, some keywords you have will make great blog content like “dentist in Denver no insurance,” which would make a great blog post helping potential customers understand what they can do to find insurance or other products they are searching for. These are high-volume words or phrases, typically between about 1-3 words. These are more general terms that should be targeted on more prominent pages, e.g. 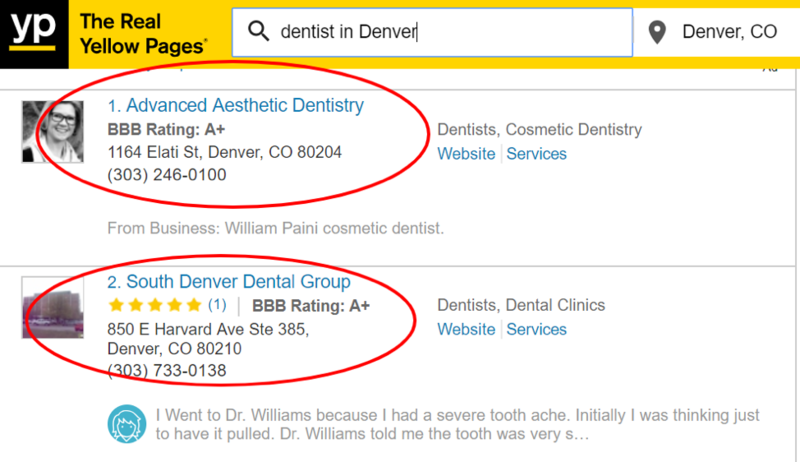 “dentist in denver” is a short-tail term that’s great for the homepage. Long-tail are longer, lower volume phrases. These are perfect to target on specific pages aligned to a search query or in blog content. Although they might generate as much traffic as your short-tail terms, they’re generally lower competition, e.g. easier to rank for. Finally, group your keywords around similar ideas and phrases. “Denver dentist,” “dentist in Denver,” and “Denver dental office” all have a very similar theme. Group like-terms together. SEO Beginner’s Guide to Marketing and Search Engine Optimization. You’ve got your keywords arranged into groups. Now, it’s time to optimize individual pages for keywords. Keyword optimization is all about improving the relevancy of your pages. Google looks at the content on your page and it determines who that content would be relevant to. By optimizing for keyword, you’re helping Google understand exactly what is on your website. This is the title of the page that appears in Google results and the browser bar. This is the main title of the page. In your content management system, you can mark a header an H1. These are subheading tags. They don’t carry as much weight as the H1 tag, and on some pages, you might not even use these tags. But if you do, be sure you incorporating keywords. Adding keywords to the URL has been shown to provide a boost in rankings, and it can be helpful for viewers who land on your page. how to optimize site for seo. Google has gotten pretty sophisticated in how it ranks content for keywords. In the past, it was all about keyword density. The more times a keyword was used, the more relevant Google used it. That’s changed quite a bit. Today, you can and should be using keyword variations within your copy. Stick to optimizing for that main keyword within the text, but in the body copy, add variations. For the Moz page, you might add “SEO ranking signals” or “SEO rank factors” to add context and help Google understand your content. Content refers to any text, video, audio, or multimedia on your website. And the better it is, the higher you rank. Simply put, Google wants to serve users the best content, e.g. the most relevant, the most trustworthy, and the most authoritative. Through keyword optimization and in-depth content development, you can increase your rankings quickly. How do you do it? When it comes to content, longer generally performs better. There’s a simple explanation. One, visitors spend more time with long-form content (more than 3,000 words), because it’s more topically relevant. It covers more of the user’s questions. Second, long-form content is more authoritative in Google’s eyes. So, take your keyword clusters and feed them into a tool like Ubersuggest. You’ll get a bunch of different ideas to help you build long-form authoritative content. best word count and website page length. Using these keywords as a guideline, you can produce a long-form guide helping people who are interested in dentures. We have also developed what’s called the “skyscraper technique” for creating quality content, and it’s a strategy that works for just about any business. And it’s effective. Here we used this technique to generate a 110% lift in traffic in just a few weeks! Find Shareable Content – Do a quick Google search and find content in your niche that’s really popular. Look for the most shared articles, videos, infographics and multimedia. Make It Better – Take your list of the top content and then create something that’s better. For example, if you see lots of blogs about on-page SEO, but not a lot of infographics, make an awesome infographic. Share Your Work with Your Network – Now you’ve got to get the word out. After you publish amazing content, reach out to people in your niche and ask them to share or link to you. You should absolutely add multimedia and photos to make your website content more interesting and allow yourself the opportunity to capture your reader’s attention for more than a few minutes. After all, the more time spent on your webpage, the better organic rankings you will find. Photos, video, multimedia and audio make your posts stickier. They draw visitors in and keep them on the page longer. In fact, the inclusion of at least one image is a reliable SEO factor for search engines. Backlinks are any inbound links pointing to your website. We just touched on that a little bit above, in the Perfect On-Page SEO discussion. Tons of people have linked to that infographic, and that’s made it one of the most popular pages for a wide rank of on-page SEO-related searches. We can also help you build your SEO by building white-hat SEO links. Inquire to learn more about our SEO link building program! Bottom line is backlinks matter. Google uses backlinks to measure the relevancy and trustworthiness of your content. So, in general, the more quality backlinks you have, the more successful your content and website will be within Google search. Start your research by analyzing your competitor’s links. See who’s linking to their sites and which pages on their sites are earning the most backlinks. A tool like Link Explorer from Moz allows you to view nearly all of the inbound links pointing to a website. how to analyze competitor backlinks. As you can see, Moz has a whopping 27.4 million links from 114,400 domains. That’s pretty impressive, and it has a lot to do with the site’s great content. Pro SEO Tip: Look for sites in your niche that regularly link to your competitors and create a list. Then, spend some time researching the type of content those linkers produce. You’ll use this list to conduct outreach. Link building is all about creating relationships. You can’t just build it and expect people to come. You have to market it, grow a network of partners who want to share your content. And then, you’ll start to see rapid growth. How do you go about building backlinks? Start by sending a short email to build a connection. You might send a short email to someone you’ve linked to in your article asking if they’d be interested in sharing your content on social media or linking to it. Pro SEO Tip: Effective outreach is all about building connections. Don’t send generic emails asking for shares; personalize every email you send. Publishers and bloggers are always looking for useful and insightful content. But here’s the thing: They don’t always have the time to produce it in-house. That’s where guest posts come in. Guest posting offers a chance for you to reach a new audience and earn a few backlinks in the process. Most often it’s great to start with a genuine email showing your interest. 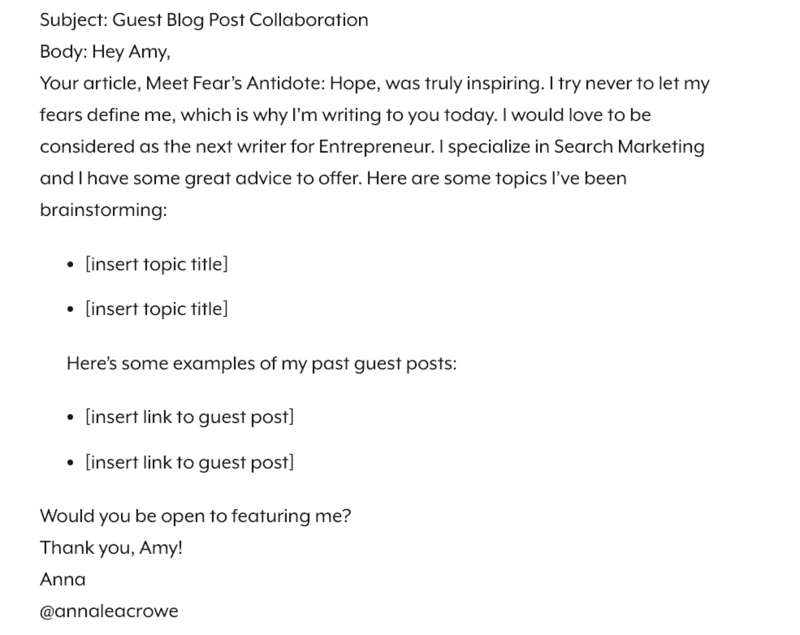 Explain why you think you’d be the right fit, and provide any ideas a short pitch for your suggested guest posts. And with the right strategy it can work. The founders of BufferApp earned their first 100,000 customers using a targeted guest blogging strategy. You can attract a lot of attention within your niche by being courteous and genuine. Start by following other bloggers in your niche on Twitter, their blogs and say thanks when you find a piece of content that’s helpful. LinkedIn is one of the best networks for sharing business content and staying connected. That’s especially true for B2B businesses. The right mix of SEO tools helps you measure how you’re doing. Using an analytics tool – like Google Analytics – you can measure traffic growth over time, understand where your users are coming from, and determine which pages attract the most visitors. A webmaster tool like Google Search Console helps you understand how people find your site within search results. And a rank tracker can help you gauge the ranking of your pages for specific search terms. Bottom line, without SEO tools, you’ll be working blindly. You won’t have a method for determining if what you’re doing is actually working. 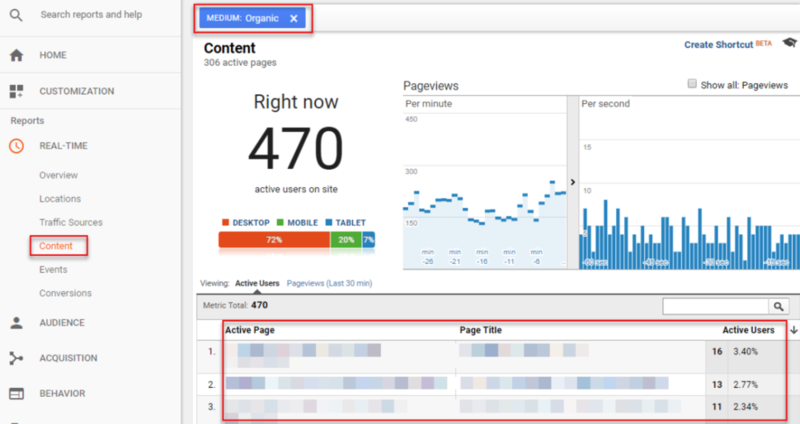 Want to learn how to install Google Analytics? Google Analytics is a free tool that provides helpful information about your traffic. This is hands-down one of the best tools to use, and if you want to get the most out of it, plan to take a course like Google’s Analytics Academy beginner’s course. You should also read our Guide on How to Become Google Certified. Acquisition Overview – This shows what channels are driving your traffic – organic search, email, direct, referral and social. This will help you gauge the success of your marketing over-time. Landing Pages – See which pages drive the most traffic to your site. These are so-called “landing pages,” and they’re the first page a visitors views on your site. This metric will help you identify the most important pages to optimize. Dwell time – Identify how long visitors are staying on each page. Dwell time is a metric of relevance. You can gauge if you’re producing helpful, engaging content by looking into dwell time for each page. Bounce rate – This is the number of visitors that view a single page and then exit without clicking through to another. Use this metric to identify pages that are bleeding first-time visitors, and then optimize them to make them more useful for visitors. Page views – This will help you measure traffic growth over time. Use this metric to gauge the success of your outreach and content marketing goals. Google Search Console is Google’s webmaster tool suite. And it’s full of rich insights into how your website performs in search results and its technical performance. Follow Google’s step-by-step instructions for installing Google’s Search Console. Once the site has verified your page, you can begin to start looking at some useful data. As a beginner with SEO, start by taking a look at the Performance and Links sections. Performance shows how often your site appears in Google search (impressions) and the number of clicks that were generated from these impressions. You’ll also be able drill down by Query or Page. Query – These are the actual search terms people use to find your site. Pages – These are the pages that generated the most impressions in search results. External Links – All the links that point to your website. You can drill down by top-linked pages, as well as individual links per page. Internal Links – The internal links on your site. You’ll see which pages have the most internal links. Pro Search Engine Optimization Tip: Use your links overview to gauge your backlink outreach success. Rank trackers provide daily updates of your website’s positions in the rankings. And they’re helpful for gauging long-term rankings growth. A good rank tracker will help you identify which pages have the most momentum, if any pages are losing rank, and your search engine rankings over time. Google wants to send people to trustworthy, reputable websites. And you might be wondering: What can I do to earn better trust? Online reputation marketing is a key. Building profiles on online directories, social media sites, and Google My Business all help show Google that you are reputable and that your business is established. NAP refers to Name, Address, Phone Number. Google collects information about your website from across the web, and NAP matters a lot. The more consistent and quality NAP citations you have on directories, business listings sites and social media, the more reputable your site looks. how to get nap citations and directory listings for your business. Pro SEO Tip: Consistency is very important as you see NAP citations. A difference like “Ave. vs Avenue” from listing to listing looks like two different businesses. Google My Business listings are super important for local SEO. If you want to rank for keywords with a city name in them, you need a Google My Business profile. Setting up a Google My Business account is fairly straightforward. You can follow these steps from Google on how to create and upload your own business listing. These listings have tremendous value for search engine rankings and organic search results. how to create a google my business listing. best examples of “google my business” listings. Here’s another example of an excellent Google My Business Listing. Clear company name including primary keyword terms. Address and Hours are listed. List of Questions and answers with business owner responses. Add as much information to your Google My Business listing as possible. Beyond address, phone, website and hours, you can answer sample questions and add photos. Google takes into account your website’s performance, when determining rankings. Websites that load faster, that provide a good user experience, and that display properly on mobile sites rank better. That’s why it’s important to continually monitor your technical performance for steady and long-term rankings growth. Start with a quick test of your page load speed. GTMetrix is a useful site. You type in your URL, and the site quickly analyzes your load speed and performance. how to test your website’s speed. The site provides great insight into performance issues, and will give step by step instructions on how you can maximize speed. how to reduce/lower page load time on your website. Test your website to see if your site performs well for mobile users. Google has a free tool. You just type in your URL and Google provides mobile optimization suggestions. how to test if your website is mobile-ready and friendly for mobile! looks like we passed the mobile-friendly google test! Pro SEO and Marketing Tip: Mobile friendliness factors strongly in Google’s search algorithm; if you see problems here, make it a priority to fix them. A sitemap is a text document that Google uses to understand the structure of your website. This helps Google crawl your website, which improves your indexability. These can be a bit complicated to produce by hand, but fortunately, there are a wide range of the best SEO Tools that will auto-generate a sitemap. how to create a sitemap for google. Search Engine Optimization, aka “SEO”, is a huge topic that takes years to fully master. But the good news is that anyone can begin learning SEO principles. And beginners can start optimizing their sites without any SEO knowledge. These seven SEO beginner tips will help you lay a strong foundation for your website. Although there are plenty of intermediate and advanced steps you can take, if you follow these tips, you’ll be outperforming competitors who aren’t taking SEO seriously.